Yet, as our Native American friend Elaine Willman points out in a recent letter to President Trump's Presidential Advisory Commission on Election Integrity, there is little or no accountability, no oversight or enforcement authority of a state Secretary of State on Election Day. Ms. Willman says, to be blunt, that is exactly how Democratic Senator Jon Tester became a Senator in 2007, and remains in office to this day. 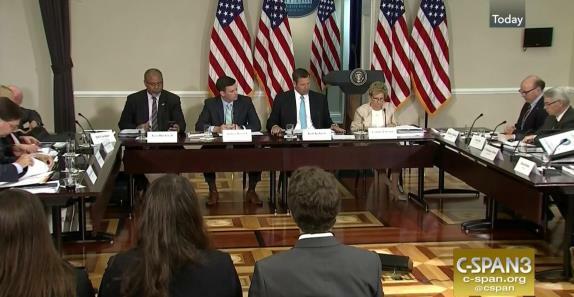 Below is Elaine Willman’s letter to President Trump's Presidential Advisory Commission on Election Integrity chaired by Vice President Mike Pence. We urge CHQ readers to get lots of emails rolling in to the Commission TODAY! The Commission’s email is [email protected] please email them today to demand the Commission investigate election fraud on Indian Reservations before Democrats use it again in 2018. I am a 27-year researcher, speaker and author on federal Indian policy issues and have lived on three Indian reservations during this time period: Yakama (WA, 16 yrs. ); Oneida (WI, 8 yrs. ); and Flathead (MT, 3 yrs). I am of strong Cherokee ancestry and my spouse is of Shoshone ancestry, being a direct descendant of Sacajawea’s adopted son, Bazil. 1. Polling sites on Indian reservations. Chronic voter fraud and irregularities on Indian reservations occur at polling precincts located on federal Indian trust land, where there is no oversight or enforcement authority of a Secretary of State. This pattern has been continuous since at least since 2006 and likely earlier. To be blunt, it is exactly how Senator Jon Tester became the 51st Senator in 2007, and remains in office to this day. A. In close elections, late arriving tribal ballot boxes swing the vote. Examples include Washington State elections of Governors Gary Locke, Christine Gregoire, and Jay Inslee, and earlier with Senator Maria Cantwell, to mention but a few in only one state. So too, this is the case with Montana’s Governor Bullock, Attorney General Fox and Senator Jon Tester. B. Tribal financial funding of candidates is a double-edged sword— a successfully funded candidate is inclined to support all tribal whims, or face a tribal-funded challenger in a next election. C. Tribal-funded incumbents at every level of government are unlikely to change laws that level the election playing field on Indian reservations, in towns, counties, states…and even within Congress. (See B, above). I have been entirely unable to find a single Congressional Statute or Regulation that authorizes tribal governments to financially participate in America’s elections. I heard discussions years ago, that the National Indian Gaming Commission (NIGC) determined that tribes' ability to hire lobbyists and financially participate in elections is good “economic development” for tribes. This may be an internal NIGC memorandum or policy that I am unable to affirm, but would request that your Commission weigh the fairness of what constitutes tribal “economic development” when such practice puts a special preference “thumb” on campaign finances, campaigns, elections and voting preferences. A Solution. By Executive Order: Affirm that no governments in the United States, including tribal governments may financially participate in America's elections; task the Department of Justice with compliance and enforcement mechanisms. I deeply value the installation of this Federal Election Fraud Commission, and am available for additional information upon request. Please extend my deep appreciation to President Donald Trump for his efforts to make America's elections great again! Submitted by email_registrat... on Mon, 11/20/2017 - 11:50. Submitted by email_registrat... on Mon, 11/20/2017 - 08:01. It never ceases to amaze me how easy it is for politicians-state and federal-to dumbing down as gullible non-Indian U.S./State citizens into believing that they-politicians-can pass common law that makes the health, welfare, safety, benefits, capacities, metes and boundaries of a select group of U.S./State citizens distinguishable because of their "Indian ancestry/race" at the same time the Constitution foreclosed just such common law by these very same politicians inregulating the health, welfare, safety, benefits, capacities, metes and boundaries for U.S./State citizens with 'slave ancestry/race' all without a shred of Constitutional authority to do so.